The Lick Run project's Headwaters Gateway District, one of many proposed green infrastructure investments aimed at addressing both blight and combined sewer overflows. 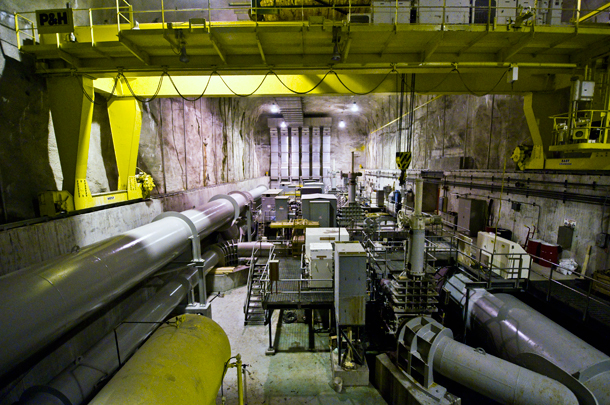 A pump room deep underground at the Calumet Water Reclamation Plant. Massive tunnels loom at the bottom of the Thornton Quarry, soon to be a TARP reservoir. Hundreds of trucks still haul stone from the quarry every day. They will finish mining this year. Rust, population loss and billions of gallons of sewage overflows — Cincinnati’s South Fairmount neighborhood can now count at least one of these former challenges as an economic opportunity. A plan to repurpose about 30 acres of brownfields and vacant lots into one of the nation’s boldest experiments in green infrastructure won the approval of the U.S. Environmental Protection Agency Monday. It is an innovative solution to a common problem throughout the Midwest, where many cities, including Chicago, have combined sewer systems that collect stormwater runoff and sewage in the same pipe. The Metropolitan Sewer District (MSD) of Greater Cincinnati will unearth a mile-long portion of a buried stream called Lick Run, which will absorb 1.5 billion gallons of stormwater each year. When stormwater overburdens the traditional pipework of a combined sewer system, it forces a spillover of raw sewage and wastewater in what is known as a combined sewer overflow. In a 2006 consent decree, the EPA ordered Cincinnati to reduce its combined sewer overflows, the nation’s fifth worst, by 85 percent. Penned in by concrete, Mill Creek runs along the side of South Fairmount and into downtown Cincinnati. The lower Mill Creek phase of MSD’s consent decree reductions calls for a 2 billion gallon reduction in combined sewer overflows by 2018. Instead of relying only on massive pipes, MSD will rehabilitate several watersheds to help control stormwater during wet weather. Along the Lick Run portion of Mill Creek, the resulting "open space corridor" could put to use vacant properties, which make up almost one third of all housing units in the neighborhood. The “grey” infrastructure alternative to exposing Lick Run and using it as a stormwater basin would necessitate new pipes 25 feet wide at a total cost of about $312 million, or about $117 million more than it will cost to create the Lick Run watershed. That would put Cincinnati in the realm of Chicago’s Tunnel and Reservoir Program, also known as Deep Tunnel. 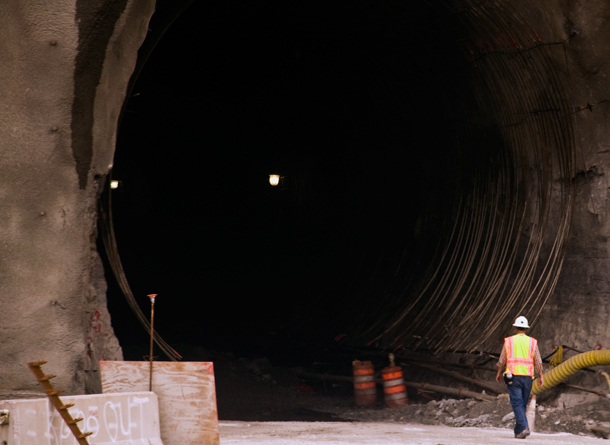 More than 35 years and $4 billion dollars into the project, the Metropolitan Water Reclamation District of Greater Chicago (MWRD) has built hundreds of miles of tunnels, some 30 feet wide and 300 feet underground. But the massive Thornton and McCook reservoirs won’t be online until 2015 and 2017 respectively, and completion of the entire system isn’t expected until 2029. In the meantime the partially complete system continues to overflow and, as Michael Hawthorne reported for the Chicago Tribune, climate change could exacerbate flooding problems just as Deep Tunnel goes fully online. In April flooding in Des Plaines was the worst seen there since the nearby USGS gauge in Riverside began collecting data 70 years ago. Chicago has made headway with its sustainable streets program, building porous streets and alleyways, but some have called for a more comprehensive investment in green infrastructure. The city’s Green Healthy Neighborhoods initiative aims for green infrastructure planning on the neighborhood scale, with vacant lots serving as bioswales or other elements of what the plan calls “productive landscapes.” Chicago&apos;s neighborhoods don&apos;t have the hills and valleys that help along Cincinnati&apos;s stormwater planning with projects like Lick Run, but the cities share similar challenges. South Fairmount’s brownfields, abandonment and historic disinvestment are not foreign problems to many Chicago neighborhoods, which could benefit from flood control both as a means to beautify blighted areas and as an economic investment.